This remarkable collection of short stories is written by a medical doctor-turned-author. Murray offers dazzling insight into the minds and hearts of men and women whom we may have thought too cerebral to have "real" lives --- dedicated physicians and scientists --- all living private lives of great complexity. Murray practiced medicine in far-flung places around the planet before turning to writing. 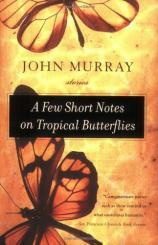 His experiences and acquaintances among peers and patients were surely grist for the mill that turned out the eight short stories in A FEW SHORT NOTES ON TROPICAL BUTTERFLIES. The title story is about an aging surgeon confronting his own physical and mental frailties as he ponders the strange, mad life of his grandfather, a famed collector of rare butterflies. In "The Hill Station," a middle-aged doctor returns to India, the land of her parents, to teach in an epidemiology symposium during a cholera outbreak. Murray shifts the story between her few days in Bombay and reminiscences of a past love. He artfully captures the cadences of language, evoking the smells and mannerisms of India from a clinic in the slums of Bombay to a jostling bus ride through the countryside in a monsoon storm. "The Carpenter Who Looked Like a Boxer" is a chilling tale of a man living alone with his children, trying to put his life back together a year after his wife left. "Blue" is short, poignant and as surreal as the conditions on the Himalayan peak. A man and his comrades are climbing to commemorate the fiftieth birthday of what would have been his father's last climb. "Watson and the Shark" takes place in the Democratic Republic of Congo during a civil war. The setting is a missionary village where doctors struggle to deal with the wounded from the surrounding brutalities. It is the only story that is primarily about doctoring under difficult conditions and bears the ring of truth and quite possibly personal experience. The stories are not all about jungle medicine, but a common thread among the main characters is their dedication to order, organization and their professions. Murray delves into the inner thoughts, hopes and dreams of the men and women who have dedicated their lives and often their souls to their chosen fields. Joyce Carol Oates selected the title story for the Best New Voices 2002 fiction anthology. "Blue" and "The Carpenter Who Looked Like a Boxer" won Murray his teaching/writing fellowship at Iowa Creative Writer's Workshop. And "The Hill Station" won the Prairie Lights Short Fiction Award.